Mary and Brian Lohse hold check symbolizing their $202.1 million jackpot. A couple from the Des Moines suburb of Bondurant turned in a $202-million winning Powerball ticket from the drawing on September 26th at Iowa Lottery Headquarters in Des Moines today. Iowa Lottery C.E.O., Terry Rich, introduced them. “I’m very proud to introduce Iowa’s newest millionaires, Mary and Brian Lohse,” Rich said as multiple family members cheered. They chose to take a lump sum payment of $129.8 million, the second largest lottery jackpot ever won in Iowa. Forty-two-year-old Mary Lohse said she first thought she had a winning ticket as she saw a story about the ticket be sold in Bondurant on the TV the next day as she left to take the kids to school. She then called her husband Brian, a lawyer for EMC who was at a conference out of town. “I didn’t believe her, I didn’t believe her boss and told her if she is telling the truth to head straight to our attorney’s office,” Lohse said. 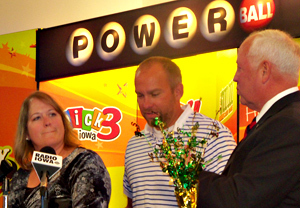 Mary and Brian Lohse talk with Iowa Lottery C.E.O. Terry Rich. He eventually believed the story and decided to leave the conference and come home early. The couple have three daughters, and he said he had some advice for them about the family’s windfall. “Basically, one they are going to get a lot more dates, which is important to the 15-year-old. But, just stay grounded and don’t change the way we’ve raised them, they are still the same person and we want to instill the same values, but obviously things are going to change,” Lohse said. Mary Lohse is a medical assistant at a pediatric clinic in Des Moines. Both are now on a leave of absence and said they are trying to determine if they will continue working. One thing they have decided is to give some money to their favorite charities. 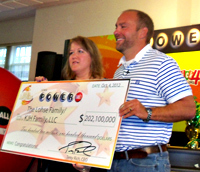 The Lohse’s jackpot was one of four big prizes won in Iowa in that September 26th drawing. There was a one-million dollar prize, a $10,000 prize were won in Powerball and there was a $100,000 prize won in another game. The jackpot is the second largest won in the state behind the $241-million won by 20 Quaker Oats employees in Cedar Rapids in June. Audio: Lohse news conference 16:00.